As soon as the sun comes out and winter fades away, terraces start flourishing all over Paris, with tables and chairs spread out in front of every restaurant and bar. 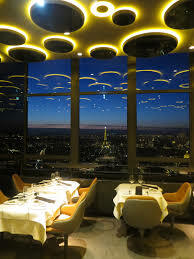 Like in the famous novel by E.M. Forster, A Room With A View, where the heroine switches rooms with her future fiancé just to enjoy a better view over the city, having an amazing view while sipping your cocktail simply adds to the magic of your experience in Paris. 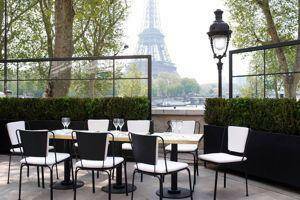 After a tour, before a museum visit, or basically whenever you feel like it… here are some good places in Paris to have drinks with a view in paris! 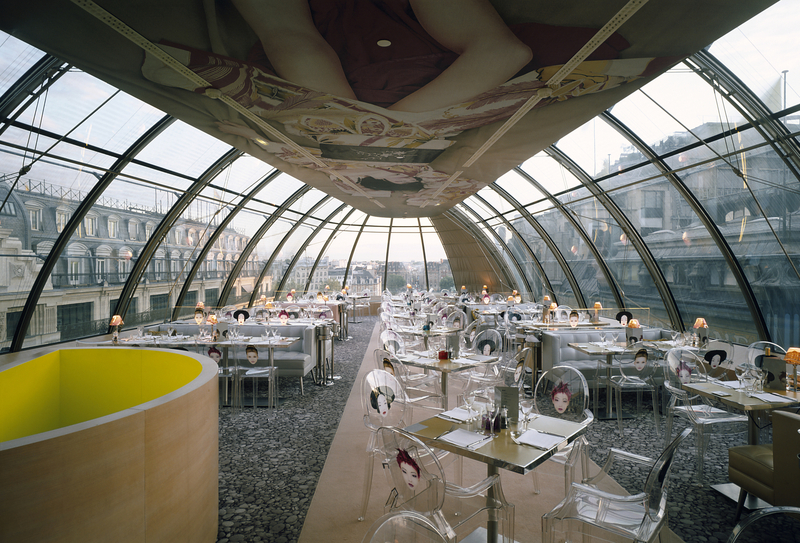 At the top of the Kenzo Building, meters away from Pont Neuf and the island of La Cité, under a modern and extraordinary glass roof, lies the bar-restaurant, Le Kong. Designed by the French designer Philippe Starck, it offers a view of the left bank and the Seine. Open daily from 10:00am to 2:00am. Located on a boat docked at the Javel Haut port, close to the Statue of Liberty and the quiet Swan Island, La Plage Parisienne truly gives you the impression of relaxing on a beach, where you can see boats sailing on the Seine. The Statue of Liberty, the Radio House and the west side of Paris are only a few of the many sites to see from your comfortable armchair… as long as you don’t close your eyes and enjoy the sunlight and the sounds of the waves. This is the best place for a drink with a view in Paris! Open daily from 12:00pm to 2:30 pm and from 6:00pm to 2:00am. Along with the Eiffel Tower, the Montparnasse Tower is one of the highest monuments in Paris, standing 58 floors high. 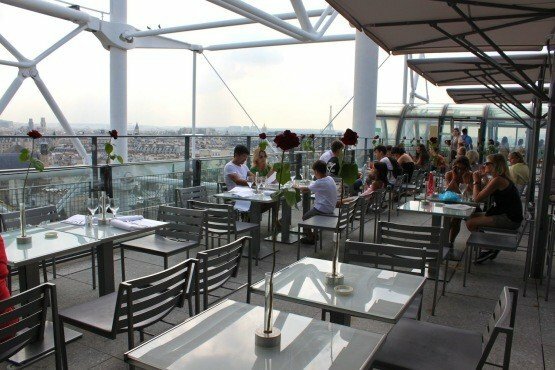 Located on the 56th floor is the trendy café/restaurant, Le Ciel de Paris, which provides an amazing view of the entire city of Paris. You have many options at Le Ciel de Paris, as they offer breakfast, lunch, tea, dinner and supper. Bar open from 7:30 to 11:30pm. For a really great drink with a view in Paris, check out the most prestigious hotels in the capital. They have bars that are trendy, glamorous and refined. The hotel, Hyatt Regency, is no exception with its bar, La Vue. La Vue offers, just as its name promises, a panoramic view of Paris, overlooking some of the city’s greatest monuments. Located at the top of the Modern Art Museum Georges Pompidou, Le Georges is a welcome moment of rest after visiting all the exhibitions of the museum. Its bay windows allow a full view over the roofs of Paris. It’s a site that cannot be missed. Open all day, every day except Tuesday. It seems that it is a must for modern art places to offer nice views of the city to its visitors, because the Museum of Contemporary Art, also known as Palais de Tokyo, also provides a great bar called Monsieur Bleu. 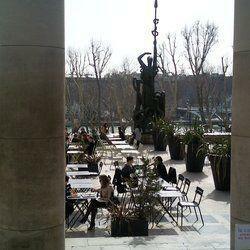 Here, you can enjoy a view of the Eiffel Tower and left bank of the Seine. Of course, during lunch and dinner hours, the better tables are spared for customers wishing to sit and eat, but between 4:00pm and 6:30pm, and after 11:30pm, the terrace is all yours! Open daily from 12:00pm to 2:00am. Only a few meters away from Monsieur Bleu, you can also enjoy a similar view from the terrace of Le Café. The atmosphere is more casual, with tables and chairs spread out near the columns of the museum. During the summer, it is not rare to see dancing couples, practicing their tango or waltz. Open Tuesday through Sunday from 10:00am to 6:00pm (10:00pm on Thursday). 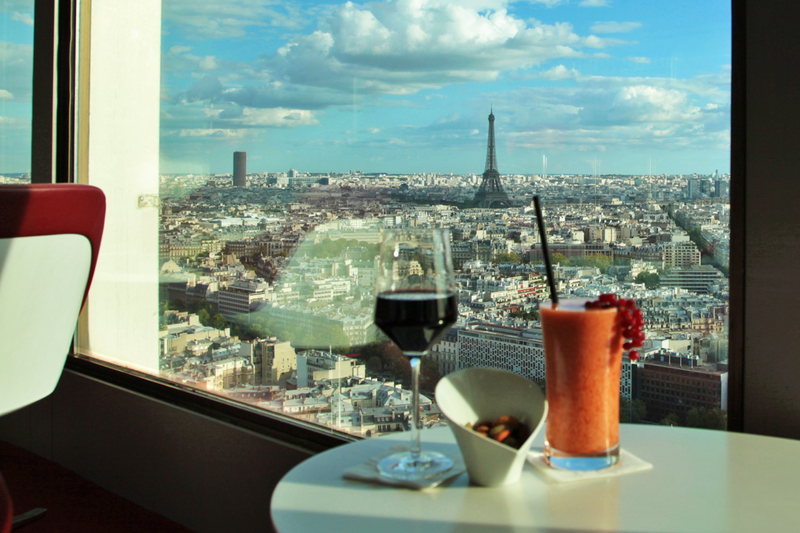 The top of the eiffel tower could arguably be the best drink with a view in all of Paris. There is a small champagne bar on the top floor for people who want a drink after climbing all the stairs or taking the elevator (there’s no shame in that). For people who want to dine, restaurants, 58 Tour Eiffel and Le Jules Verne, are located on the lower floors. 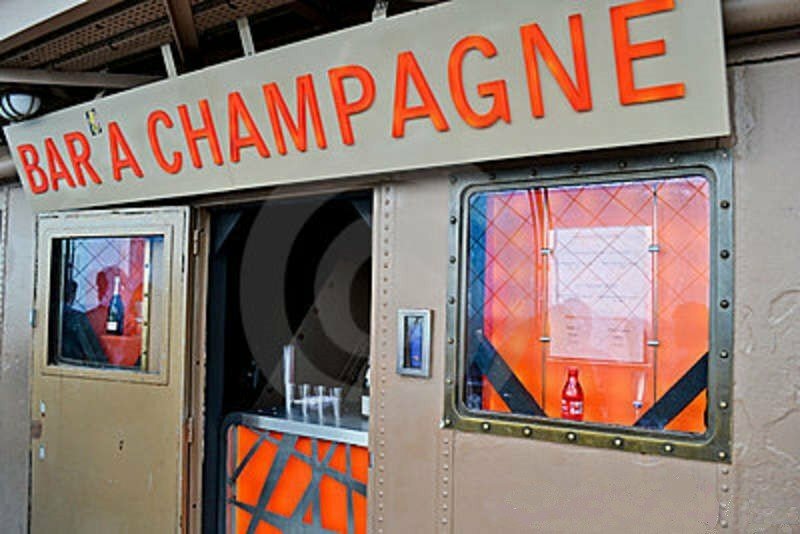 However, be warned, the champagne bar can only be accessed with your Eiffel Tower ticket and it is quite tiny, as there are no seats. Also, a glass of champagne costs a minimum of 12€… but don’t forget, you will be having a glass of champagne on the top floor of the Eiffel Tower, so… it might just be worth it. Open every day from 12:30pm to 6:00pm and 6:45pm to 10:00pm.